Once I started making this recipe, I realized that it isn't exactly the kind of dish that requires a recipe. It's very simple and is just some basic ingredients thrown together. The other thing that I realized is that it is important to have good quality ingredients, since there is so much emphasis on the ingredients themselves without sauce or seasonings. I did not have high-quality ingredients, and I ended up being really disappointed. It was not delicious. I quadrupled the amount of pine nuts, because I absolutely love pine nuts, and I used lemon juice instead of lemon zest. However, I don't think these changes were the cause of the mediocrity of my dinner. I would not make this recipe again. Canned artichoke hearts give this dish a Mediterranean flavor without the work involved in preparing fresh ones. Cook orzo in a 4- to 5-quart pot of boiling salted water until al dente. Drain in a colander. While orzo cooks, lightly toast pine nuts in a dry small skillet over moderate heat, stirring, until pale golden, about 2 minutes. Remove from heat and cool 1 minute, then coarsely chop. Drain artichoke hearts in a large sieve and rinse well. Pull off leaves from bases of hearts and quarter bases. Rinse leaves and bases well, then drain thoroughly. Stir together oil, vinegar, salt, and pepper in a large bowl. 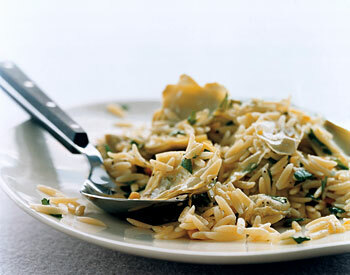 Add orzo, pine nuts, artichokes (leaves and bases), parsley, and zest and toss to combine. Last night I made Bean Cake Sandwiches and they were good but I cut the crap out of my finger when slicing the onion and had to go over to the fire department across the street and make the EMTs bandage me up. It wasn't pleasant, but my food was still delicious. Tonight I made this recipe for Broccoli, Cheese, and Rice Casserole, because I already had most of the ingredients required. It was not awesome. The rice goes in uncooked, which is weird and it doesn't cook through all the way. The Velveeta is not enough cheese, it needs some kind of delicious coating on the top. It is also pretty boring. I will not make it again; I will stick to my mom's recipe for it because hers is much better. Maybe I'll make that soon and then I'll post the recipe for it. My new boyfriend was here this weekend and we decided to bake some cookies. I found this recipe on desertculinary.blogspot.com after being referred there by another website. The picture just made it look so awesome that I decided it would be perfect to make and delicious to eat. They turned out to be very tasty. They didn't look like the picture - for some reason, they didn't flatten out all the way. I had to kind of smack them on top with a spatula to make them into a more cookie-like shape. Which worked out well, because then they looked fine. :) We halved the recipe and still came out with about 2 dozen cookies, which hopefully will last me at least a week, but we'll see. Beat butter until creamy. Gradually beat in white sugar and brown sugar. Beat in eggs and vanilla. Combine flour, baking soda and cocoa. Gradually add to butter mixture, beating well. Coverand chill at least 2 hours. of dough around a chocolate covered caramel (such as a rolo). Roll into a ball. Dip the tops gently into the granulated sugar. Place sugar side up, 2 inches apart on greased baking sheets. The diet of northern European peasantry relied heavily upon the potato ever since it was imported from Peru in the sixteenth century. In Celtic Britain it was taboo to harvest any potatoes before the festival of Lugnasa, and so the event was met with great anticipation. Colcannon, a potato and cabbage dish-variations of which are legion-is traditionally served on Lugnasa. All members of the family must share the dish or risk offending the agricultural spirit that protects the crop. After the first bite everyone shouts, "Death to the Red Hag!" thus driving away the specter of starvation. Rumpledethumps is a colcannon that includes broccoli and cheddar cheese; it serves equally well as a luncheon or side dish. There are over one zillion know varieties of colcannon, and we have tried them all. This one is best. My changes: I didn't use mace, and I didn't have any leeks so I threw in some sauteed shallots. Oh and I tossed in a little bit of garlic, because everything benefits from garlic. My thoughts: delicious, and I will make it again. Next time I will make sure to cut the cabbage up into smaller pieces before steaming it. Peel the potatoes, cut them into chunks, and boil them in salted water for 15 minutes. Meanwhile, steam the cabbage, leeks, and broccoli. Melt 2 tablespoons of the butter and stir in the mace. Mix this seasoned butter and salt and pepper to taste into the steamed vegetables. Drain the potatoes and mash with 2 more tablespoons butter, the milk, and salt and pepper to taste. Stir in the seasoned vegetables and mix evenly. Spread in an oiled 13x9-inch baking pan. Melt the remaining 2 tablespoons of butter and drizzle it over the potato mixture. Sprinkle the top with the grated cheese. Place under the broiler for 3 to 4 minutes or until the cheese is browned and bubbly. If you'd like to prepare Rumpledethumps ahead of time, omit the cheese topping, cover the baking pan tightly, and refrigerate. Later, bake, covered with foil, for 30 minutes at 350º. Uncover, sprinkle with the cheese, and place Rumpledethumps under the broiler for a few minutes to brown. It turns out that Turkish Delight candy from the UK is vile stuff. It's rosewater-flavored jelly covered in chocolate. I despise rosewater with a fiery passion. It was disgusting and was like eating a bar of soap. I will never eat this candy again. Cadbury Flake bars are not very good either. I had heard such wondrous things about them but it tasted like cheap chocolate you get at Easter or something. I haven't had many "excellents" lately, so I wasn't expecting much of this. Actually, as I was making it I was thinking "Man, this looks a lot like my vegetable chili." I figured it was going to be similar to that, and then I'd probably never make it again because why do I need two recipes for the same thing? But then I added in the cheeses, and ohhhh man the whole thing changed. It is delicious. I absolutely loved it. I abhor Velveeta but it is absolutely necessary for this recipe. No other cheese would work right. Anyway this was really, really good. I would definitely make it again. My changes: Halved the recipe (and still had wayyyy too much left over), used more zucchini instead of the summer squash, used canned corn instead of fresh, and used low-fat Neufchatel instead of cream cheese. In a large pot, heat olive oil and sauté the onion until tender. Add garlic and jalapeno and cook 1 minute longer. Add the zucchini and corn and cook an additional 1 minute. Add chicken broth, tomatoes, and green chilies. Bring to a boil; reduce heat and simmer, covered, for 10 minutes, or until squash is barely tender. Reduce heat to low and stir in Velveeta and cream cheese; stir until cheeses are melted. Season to taste with salt and pepper. Ladle into bowls and top with sliced green onions and chopped cilantro, if desired. Some women at work always order club sandwiches from this place down the street. I used to eat club sandwiches allll the time before I stopped eating meat, so watching them enjoy these sandwiches of happiness inspired me to look for a vegetarian version. It turns out that vegetarian versions are hard because they turn out to be little more than some vegetables and stuff shoved between some slices of bread. The essence of the club sandwich is the combination of bacon and chicken or turkey (or some other kind of meat). Take that away, and you don't have much else. I thought about using veggie bacon, but then it's just a 3-tiered BLT. Anyway so the recipe I settled on involved hummus as the main ingredient, which I do enjoy. It is obviously easy to make, especially if you do what I did and skip the hummus steps altogether - I just used store-bought hummus. It was good but it was missing something, I don't know what (...bacon...). Maybe sometime I'll try it again and add some apple and horseradish and vinaigrette and carrots and then it'll taste like the excellent vegetarian sandwich at Darwin's Ltd in Cambridge. Combine first 8 ingredients in a food processor; process until smooth. Spread 2 tablespoons hummus over 1 bread slice; top with 1/2 cup lettuce, 2 tomato slices, 1 onion slice, 1 bread slice, 1/4 cup cucumber, 1 cup sprouts, and 1 bread slice. Cut sandwich diagonally into quarters; secure with wooden picks. Repeat procedure with remaining ingredients. *Walker's Sensations Crisps, Thai Sweet Chile flavor: I do not know how to describe these other than that they taste like Japan. It's not quite spicy, it's just this weird flavor that reminds me of Japan. They're good though. Odd. *Jaffa Cakes, original flavor: These are spongy biscuits with orange jelly inside, with chocolate on the bottom. I gave some to my men at the grouphome too and we decided that they are odd little snacks but not bad at all. Much better than the lemon-lime flavor, for sure. Nothing is better than a BLT. And since I don't eat meat, I make mine with soy bacon, which is surprisingly delicious and bacon-y. Yum yum yum. Fake bacon, tomato, lettuce, and lots and lots of mayonnaise on toast. Soooooo good. On the SA Forums, we did a snack swap. My partner is located in Wales. I mailed him a box of American goodies, and in exchange he sent me some Welsh goodies. I sent stuff like Reese's, Twinkies, and Take 5 bars. The Galaxy Ripple was melted so I ate it out of the wrapper with a spoon. It was quite delicious chocolate, sweeter than the chocolate in America. The Fruit Pastilles are very yummy, because I love fruity gummy candy. The lemon-lime Jaffa Cakes are super weird-tasting, but I liked them anyway and will still eat them. And the Kinder Happy Hippos are amazing and I will forever be asking people to mail them to me from the UK. This recipe has been surging in popularity lately on the CLBB, though it was in the magazine back in 2000. Because everyone reviewed it so highly, I decided to make it. It was ok. I didn't love it, but I didn't hate it. The rosemary was a little bit overpowering- which is surprising since I LOVE rosemary. But I mean, I had two servings of it so it wasn't bad at all. I wouldn't make it again, but I enjoyed it this evening. Heat oil in a large nonstick skillet over medium heat until hot. Add yellow squash, zucchini, onion, and rosemary; cook 20 minutes or until vegetables are tender, stirring occasionally. Cool. Combine squash mixture, rice, and chives in a large bowl; spoon into a 9 inch pie plate coated with cooking spray. Combine milk and remaining 5 ingredients; stir well with a whisk. Pour over squash mixture. Bake at 350 for 45 minutes or until center is set. I made these cookie-type things this morning. They are from a Pillsbury Bakeoff recipe, and deservedly so because they are amazing. Everyone needs to make them ASAP. They're super-easy. Make sure you let them set for the full 2 hours because the praline middle needs time to solidify. Otherwise it gets kind of gooey (which is not necessarily a bad thing). Brookies, where cookie dough is baked on top of brownie batter, are taken to a new level with the introduction of a praline layer. 1. Heat oven to 350°F (325°F for dark pan). Spray 13x9-inch pan with cooking spray. Make brownie mix as directed on box using oil, water and eggs. Spread batter evenly in pan. Bake 25 minutes. 2. Meanwhile, in 2-quart saucepan, heat butter, milk, granulated sugar, brown sugar, pecans and vanilla to boiling over medium heat, stirring constantly. Reduce heat to medium-low; simmer 3 minutes, stirring occasionally. Remove from heat; set aside until brownies are baked. 4. Bake 23 to 28 minutes longer or until cookie topping is deep golden brown. If serving as bars, cool 2 hours; cut into 6 rows by 4 rows. If serving with ice cream as dessert, cool 20 to 30 minutes; cut into 4 rows by 3 rows. I was in the mood for a pizza so I picked this one from Eating Well magazine. It was reviewed nicely on the Cooking Light forums, so I decided to make it. My only real changes are that I used basic pizza dough instead of whole-wheat, didn't include the pepitas, and used a Mexican blend of cheeses instead of the gouda/cheddar. Oh and I didn't use fresh oregano but I never use fresh herbs. It was good and tasty, but not worth the effort. I would probably not make it again, but I did enjoy eating it. This recipe uses mashed beans as a base rather than the usual tomato sauce or pesto. The delicious result is more protein and a very tasty pizza. 1. Place oven rack in the lowest position; preheat to 450°F. Coat a large noninsulated baking sheet with cooking spray. 2. Combine oil, onion and salt in a medium saucepan. Cover and cook over medium-high heat, stirring often, until the onion is softened, 5 to 7 minutes. Reduce heat to medium-low, uncover and cook, stirring occasionally, until very soft and golden, 5 to 8 minutes more. 3. Meanwhile, roll out dough on a lightly floured surface to the size of the baking sheet. Transfer to the baking sheet. Bake until puffed and lightly crisped on the bottom, 8 to 10 minutes. 4. Stir oregano and pepper into the onion. Transfer half the onion to a small bowl. Add beans to the remaining onion; cook over medium heat, stirring often, until heated through, 2 to 3 minutes. Transfer the bean mixture to a food processor, add water and vinegar and pulse until a coarse paste forms. 5. Spread the bean paste over the pizza crust. Top with the reserved onion, tomatoes, cheese and pepitas, if using. Bake on the bottom rack until the crust is crispy and golden and the cheese is melted, 11 to 13 minutes. Slice and serve. Ingredient notes: Look for whole-wheat pizza-dough balls at your supermarket. Check the ingredient list to make sure the dough doesn't contain any hydrogenated oils. Hulled pumpkin seeds, also known as pepitas, are dusky green and have a delicate nutty flavor. They can be found in the health-food or bulk sections of many supermarkets. I forgot to post this: the other day he was inspired to make dinner, and chose this recipe from Miss Paula Deen. It was very good and he did a great job putting it all together. The recipe is very simple and quick, which is always nice. 1. Toast party rye on both sides under broiler. 2. In a bowl, stir together mayonnaise, Parmesan, mushrooms,and onion rings. Spread on toasted party rye. Place on baking sheet on lowest rack in oven. Broil until browned and bubbly. Made this for dinner tonight. It was okay, nothing special. It was good for dinner but I won't make it again. My changes: swapped in baby portobellos for the shiitakes, vegetable broth instead of chicken broth, didn't have black sesame seeds, and used soy sauce instead of hoisin sauce. Combine sesame seeds and 1/4 teaspoon salt in a large bowl. Add the tofu cubes; toss gently to coat. Combine oils in a large nonstick skillet over medium-high heat. Add tofu; stir-fry 5 minutes or until tofu is golden. Remove tofu from pan; keep warm. Return pan to heat; coat with cooking spray. Add mushrooms; stir-fry 3 minutes or until mushrooms begin to brown. Add asparagus; stir-fry 4 minutes or until asparagus is crisp-tender. Reduce heat to medium; stir in green onions. Combine broth and next 4 ingredients (broth through garlic sauce). Add broth mixture to pan; remove from heat (sauce will thicken). Add tofu and remaining 1/4 teaspoon salt; toss gently to combine. Serve over rice.